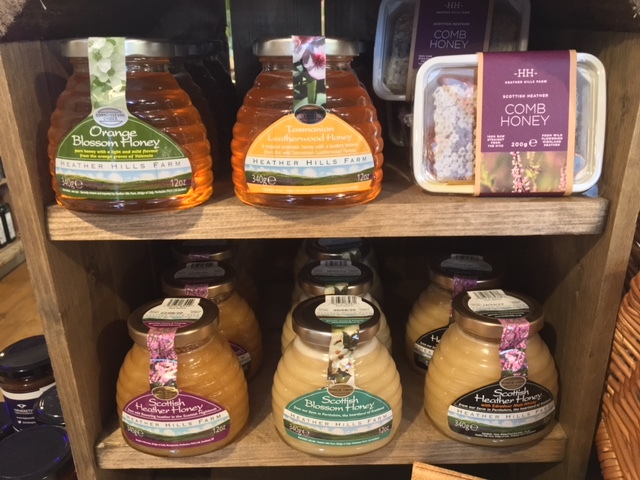 We have a great selection of sweeteners at Heart Space Whole Foods and honey makes for one of our favourites. We are delighted to be able to stock Heather Hills Honey, a company based in Perthshire to bring you the very best in local honey, blended honey and by-products of the honey production process. Established in 1945, Heather Hills Farm is a traditional family-run honey farm based in the Highlands of Perthshire – the heartland of Scotland. We specialise in a selection of 100% pure, raw, monofloral and polyfloral honeys and handmade preserves. Starting off with just one hive in 1945, we now have 1300 hives across Perthshire and Deeside – the most beautiful and unpolluted parts of the UK. This relatively small-scale ensures our hives are regularly and well spaced out in small batches by zones. This means that the bees have plenty of opportunity to roam – up to a 5 mile radius of each hive – giving a superior quality product. A bigger producer would normally cram around 100 hives into the same space – this reducing the quality of the product. Isn’t that amazing! In the store now we have Orange Blossom Honey, Tasmanian Leatherwood Honey, Fresh Honey Comb, Scottish Heather Honey, Scottish Blossom Honey and Scottish Heather Honey with a touch of Whiskey. Follow them on Facebook and Twitter for more recipes and updates on their bee keeping movements!